In 1912 a 34-inch fire bell was bought from the Schwabacher Hardware Store for $31.50. 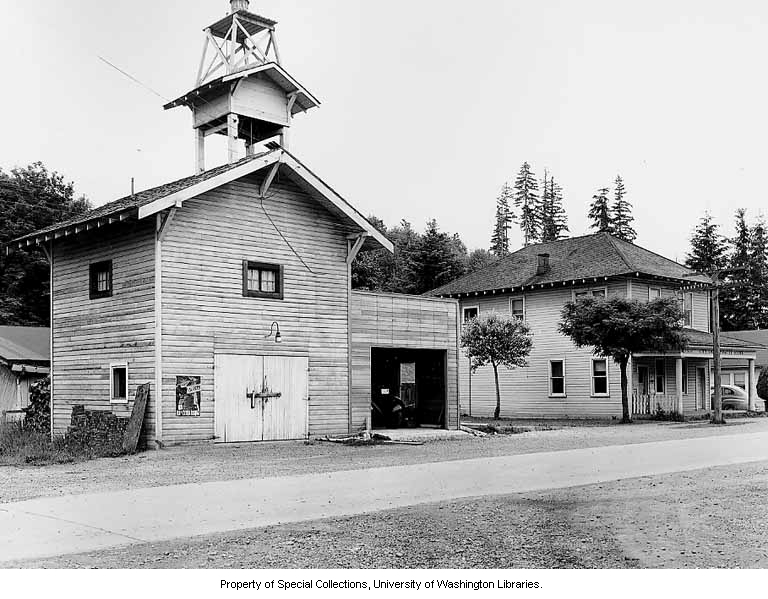 The Council and Mayor Snow held a special meeting in front 0f the fire hall February 9, 1912 to consider plans for a bell tower. It was erected back of the fire hall and painted to match the other buildings. This is one of the University of Washington’s photos, and if you’d like to see more, or order a print of it, you can click HERE. 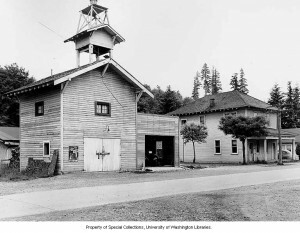 This building was still standing in the mid 60’s when I had my TNT (Tacoma News Tribune) paper route. By then it had been upgraded with better doors, etc. The newspaper pick up box was up against the far side of the firehouse, in the little vacant lot, between the fire house and city hall. I used to go into the fire house to warm up on my early morning Sunday route during those cold winter months. The Sunday papers were always so big and heavy, I would split my route into 2 parts. When I went back for the second load of papers, I would go in the fire house, it was always unlocked, and was kept moderatly warm in there. I would sit on the runningboard of the old ’49 Dodge fire truck, and warm up before having to go out in the cold again. I was tempted to laydown and take a little nap, but I was afraid i would not wake up in time, and half my customers would be without their Sunday papers. I must have done OK, because I made the honorary list of the TOP TEN paperboys for the whole Tacoma News Tribune area ! !